Hello, Hans CANY. You are thus one of the original founders of national-anarchist current ? HC: Yes, I contributed to the launch of this sphere of influence from the end of the 1990s e.v., simultaneously with Troy Southgate in the United Kingdom, and Peter Töpfer in Germany. Töpfer is out of the race nowadays, because he transferred in other domains. Troy Southgate and myself are today two of the three founders, and we're still in track. HC: Those who deny national-anarchism on these bases totally go the wrong way. The national idea is well and truly present in big references of anarchism, from Proudhon to Bakounine, via Gustav Landauer or even Nestor Makhno. Those who skip over this reality, or ignore the facts, in the best of cases, or pretend to ignore them, because it strikes too much their ideological dogmaes. Some American bakuninist anarchists, at the beginning of 1990s e.v., without using the term yet, were in a way precursors, proto-NAs. It is necessary to understand that the national-anarchistic are on no account nationalists, in the sense where they totally reject the Nation state. The nation is not the State. A real nation, for national-anarchists, it is established on ancestral and cultural senses of identity, and also and especially on the free and voluntary association of peoples and individuals who compose them. They can choose to constitute themselves in non-state nations, on the basis of affinities, may them be of ethnolinguistic order, philosophic, religious, or of some other nature. From there comes our complete, internal as well as external federalism. The leftist ideological conditioning made such devastation by standing out everywhere that the words "nation", "border", "sovereignty", "homeland" are reviled, and vilified by the guard dogs of the dogma. Do it come to their mind to attack the Amerindians, just because they define themselves in Cheyenne nation, Navajo nation, Hopi nation, Apache nation, Mohawk nation, Sioux nation etc ?? And what do they wait to question the name of their Confederation Nationale du Travail (National Confederacy of Work), while we are at it ??... C'mon, let's be serious. The national idea and the anarchistic idea have nothing incompatible, and national-anarchism is far from being an oxymoron, however unpleasant it might seem to the indoctrinated. The best proof is the simple fact that we are there. You speak about american bakuninists. Who were they ? HC: It was about the Raven's Banner Collective, based in Florida, and with the members of whom I corresponded a lot and exchanged, between the beginning and the middle of the 1990s e.v. These, as well as the ritish publication Alternative Green, ran by Richard Hunt (RIP), influenced me a lot, and it is especially from the ideas they developed that I began to develop what was going to become my own vision of national-anarchism today. The Raven's Banner Collective advocated self-determination for all peoples, national sovereignties, affinity groups, anti-imperialism, direct democracy, radical environmentalism, self-management. Alternative Green developed on his side a radical, anarchistic and rooted environmentalism. All this contributed a lot to establish the foundations of national-anarchist movement as it appears today. Where are you situated, within the anarchistic family ? HC: I would not risk qualifying it of big family, strictly speaking. Certainly, there are the upholders of the leftist approach of the anarchism who stand more or less together against the alleged " confusionists " that we are. But that is them the real confusionists, because they try by all means to silence all which brings out nails of their ideological dogmas, and because they hide to the public the existence of an other approach of anarchism. Neither of left nor right, this one. Besides, they are split in multiple rival chapels themselves tear themselves to pieces. Having said that, these people are right when they say that we are not from the same world, and even less from the same family... We have only little in common. The national-anarchists have no vague desire to infiltrate their ranks, they can be quiet about that. May them thus leave their dissidents in peace, instead of trying to persecute the first blade of grass which exceeds. 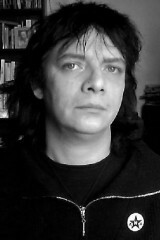 Anyway, national-anarchism, the one that I conceive, is not situated either at the right, or at the left of the System. It is situated outside, and opposite. 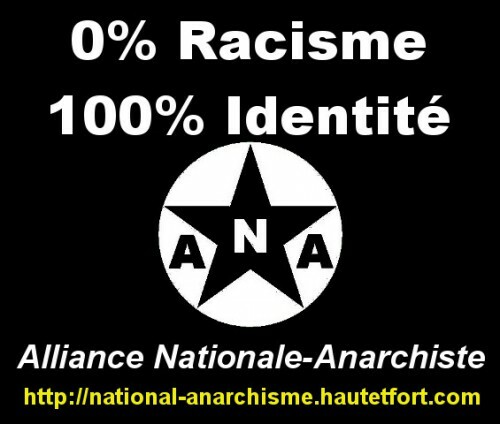 The national-anarchists are sometimes described as racists, crypto-fascists even neo-nazis. How do you justify you, with regard to all this ? What would you respond to those who assimilate your anti-zionism with anti-semitism ? HC: It is necessary to finish it once and for all with this intellectual terrorism which consists in assimilating systematically any opposition to Zionism with anti-Semitism. This is a vast swindle. Zionism is the pro-Israeli Jewish nationalism. The antizionism takes place in opposition to the zionism on the political level. Thus, antijudaism, concerns religion. And anti-Semitism - unfit term because the Arabs are Semites too - is the hatred and the rejection of jews from a "racial" point of view. Therefore, there is objectively no link between political opposition to a doctrine and to an entity, a religious opposition, and racism. There are even numberous antizionist jews, and they are not the least radical. Those who claim the opposite lie, and know it very well at the bottom of themselves. The national-anarchists are not anti-semits. They even refer , among others, to Gustav Landauer, a german jewish anarchist murdered in 1919 by the reactionary forces. The lies, the slanders and the defamation have to stop. HC: The big majority of those who stupidly believe to hurl me a charge element by pointing that are generally big ignorants, who do not even know about what they are speaking. Here again, more than 40 years of media propaganda to demonize Gaddafi and " his regime" made severe devastation. Especially on weak spirits and the most manipulable. I even saw some of them who still confuse Gaddafi with Islamism, while it is exactly the islamist rats from Al-Qaeda and assimilated, supported by the NATO imperialist criminals,who killed the libyan Jamahiriya ! That beats everything !! No comments. They should get over their dismaying prejudged, and make the effort to discover what are really the principles of the Third Universal Theory, green Socialism. So, they will have the surprise to see that everything is based on direct Democracy, non-Marxist socialism, anti-imperialism, abolition of wage, free access to numerous things, societal progressim and so on. All this is perfectly exposed in the Muammar Gaddafi's Green Book, which I recommend very strongly. If there was a country the system of which got closer to libertarian socialism (or anarchism), it was for sure the Libyan Jamahiriya. Besides, Muammar Gaddafi, several times, quoted Proudhon, Bakounine and Kropotkine among his own influences. It is not for nothing, and the Green Book reflects this. Let's stop gulping all the lies coming from the imperialist criminals of 2011. Shame on those who approved them, or who remained indifferent. You also show yourselves in the domains of deep Ecology and defense of animals. Is this fight for a secondary sector, with regard to your other objectives ? HC: Not at all, everything is complementary. For national-anarchists, human liberation, animal liberation and liberation of the Earth form a inseparable whole . As well as proclaimed by the Raven Banner Collective companions in 1992 e.v., ecological awareness, a consciousness which tells us " Earth First! ", must be present at the heart of all the revolutionary transformations of society. It's the same for the cause of our animal brothers. To paraphrase Bakunin, I would say that I become really free only with the freedom of others. The industry of meat, the breeding, vivisection, hunting, fishing, bullfight, circuses and zoos threaten the animal, a sensitive being, in the same way as pollution, exaggerated urbanization and greedy overexploitation of their resources threaten the environment and Mother Earth. Besides, the monstrous exploitation of animals has a catastrophic impact on environmental and sanitary plans, and also on the human beings. Everything is connected. We classify you as regionalists, also. HC: This term of regionalism is unfit. It sends back to the notion of "region", "province", dependent on a central state. We are not pro-independence either necessarily, when it supposes the institution of a new Nation state. The most suited term concerning the national-anarchists is autonomists. Autonomism is more radical than old-fashioned regionalism, but without the state control which itches some pro-independence nationalists. The national-anarchistic doctrine advocates the explosion of the current nation-states, to split them in multiple autonomous regions, federated each others by affinities, and who would have the possibility to group together within big confederacies, or federations of federations, on the scale of a current State, or even at continental a continental level, for example. And even these federal autonomous regions could be brought to be equipped themselves with federal structures, at any levels. This is to guarantee a maximal autonomy to everyone. This is why we are complete federalists, because partisans of both external and internal federalism. From that comes our global support for many fights of national and social liberation, not only within the alleged France, but also all over the world. Will you vote the next election ? HC: Nope, may the gods protect me from that ! I shall not sign a blank check to swindlers who just try to be caliphs instead of the caliph, and who usurp the people's sovereignty by wrapping themselves chastely under the folds of a false "democracy" flag. The democracy, the real one, has strictly nothing to do with this sinister masquerade of the elections and of the false alternation. This system has been living for too long, and deceived the masses enough . Its time is finished, as well as the governments and Nation states era. It's now time for a real democracy, by the peoples and for the peoples. Thus, do you advocate and support Direct Democracy ? HC: Yes, completely. The so-called "representative", indirect, alleged parliamentary "democracy", is only a rough forgery of authentic Democracy, a word which was completely deprived of its original meaning. The current regime is on no account a democracy. We could even say that it is all the opposite. It is in reality about an oligarchy, in which only a small number exercises the power and maintains their control. The national-anarchists advocate direct, real Democracy, with popular control and possible revocation of the appointed. Numerous sources can be explored in this direction. At first, there the first of the three parts of Muammar Gaddafi's Green Book , which is dedicated to this question of direct democracy and its organization, what is brilliantly made. We can also refer with profit to the Athenian democracy, to the Swiss and Venezuelan examples, to diverse historic experiments, such as the Commune of Budapest in 1956, the Catalonia anarchists during the spanish civil war, the experiment of makhnovists in Ukraine etc. And we can also turn towards the citizen initiatives in this way, who appeared a bit everywhere for a few yars, especially in France and in Europe. We shall think, for example and among others, of the sphere of influence for a real democracy which revolves around Etienne Chouard. What is the national-anarchistic position concerning historical revisionism ? HC: This question remains in the free appreciation of each, the opinions on the subject may be diverse and varied, according to the individuals. The National-anarchistic Alliance has in any case no vocation to make a commitment in the militancy for the cause of the historical revisionists and their works. Nevertheless, it clearly takes a stand for freedom of research, expression and publication / distribution for the Holocaust deniers, and for the opening of free public debates. It wishes the abrogation of the villainous and destructive of freedom anti-revisionist law, called the Fabius-Gayssot law. Do you get involved in ground actions ? Do you advocate violent action ? HC: Personally, not at all. The auxiliary militias of the System, these useful idiots of the bourgeois order whom are the leftists and other "antifas", have too deeply gangrened the social and militant movements as a whole for having any illusion at this level. At least, as things stand at the present. Anyway, I doubt the skill and the degree of political consciousness of the working class, and I do not believe in the virtues of the violent revolution. As a good proudhonian , I aspire to a "soft" revolution, by the mean of radical and gradual reforms. And before anything else, it is the mind revolution that has to bear fruit first of all. We condemn firmly the violence and the damages committed by leftist troops and decerebrate " antifas ", recently. Thank you for this interview. To end up, what is the current state of the national-anarchist sphere of influence ? Are your expectations satisfied ? HC: The English-speaking section, the National-Anarchist Movement ( N-A.M), led by Troy Southgate, is these days the most developed section, and has the vastest impact at the world level. The National-anarchistic Alliance registers a more and more important progress of its audience, as the walls of the lie and the slander are collapsing. Sections exist in the USA, in Spain, in Catalonia, in Italy, in Portugal, in Poland, in Russia, in Hungary, in Canada, in Brazil, in Australia... and I forget some others, without any doubt. internationally, the national-anarchistic current is rapidly growing, at present. Our message finally passed, and passed well. Our opponents and our enemies of any edges will have to count with us from now on - and it will count more more with this strength of future that we embody. Je vous applaudis pour votre paragraphe. c'est un vrai boulot d'écriture. Poursuivez .